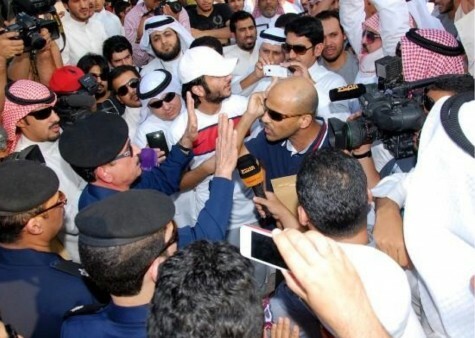 Human rights defender Abdulhakim Al-Fadhli was beaten and bruised by policemen in Kuwait while being transferred from court to prison, according to information received by the Gulf Centre for Human Rights (GCHR). This was despite the fact that one of his sentences was suspended for his human rights activities. On 14 June 2016, Al-Fadhli was returning in handcuffs from a hearing held by the Court of Cassation on his way to the central prison in Kuwait, when he was subjected to beatings at the hands of three policemen, leaving him with a bruise and a visible injury on his forehead. At the hearing, the Court of Cassation ruled that it would convert the first of several cases against him, in which he is accused of calling for a gathering, from a felony to a misdemeanor. As a result, the one-year sentence was suspended and the court ordered he be released pending review of his case the Misdemeanors Appeals Court. However, the possibility remains of Al-Fadhli being deported from the country, as part of his original sentence on 16 May 2016, until the Misdemeanors Appeals Court considers the case. In addition, Al-Fadhli is still in prison serving a three-month prison sentence issued on 23 February 2016 on a charge of misuse of the phone related to his participation in a peaceful demonstration on 02 October 2013. GCHR strongly condemns the beating of Abdulhakim Al-Fadhli by the police and believes it is a direct result of his peaceful and legitimate work for the promotion and protection of the rights of the Bedoon community and the exercise of his right to freedom of assembly. The GCHR calls on the human rights mechanisms of the United Nations and the European Union to ensure that Al-Fadhli is not deported and that the charges against him are dropped.